A look at all things tennis. Not breaking news, but interesting information served with a little more spin. Follow me on twitter @JaredPine or on YouTube (https://www.youtube.com/user/pinejared). The Sports Illustrated Sportsperson of the Year award is one of the more prestigious awards in sports, so as a tennis fan, I should be stoked that it went to a tennis player. After all, that means more attention to the sport. However, the award went to the wrong tennis player, Serena Williams. That's not to say that Williams' accomplishments weren't impressive in 2015. She won three grand slams and reached the final of the fourth. She recorded a 53-3 record and had 3885 more ranking points than the No. 2 player in the world. Williams also won two titles apart from her three slams, winning both in her home country in Cincinnati and Miami. 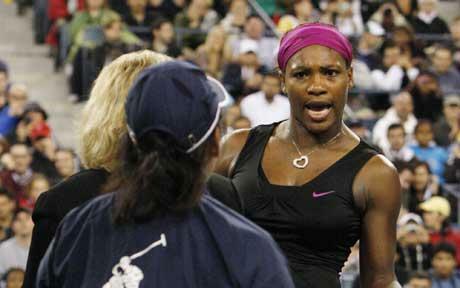 Against her top 10 peers, Williams won five of her six matches and pulled out from a potential clash with then world No. 3 Simona Halep. In fact, Williams' whole season was plagued by injuries. She pulled out of matches three different times and then just ended her season after a shocking loss to world No. 43 Roberta Vinci in the semifinals of the US Open. However, ATP No. 1 Novak Djokovic's accomplishments are better than Williams' in every category. Djokovic also won three grand slams and reached the final of the only major that he did not win. His record was 82-6 and he never withdrew from a match. He was also 7640 points ahead of world No. 2 Andy Murray. Djokovic didn't have the benefit of playing tournaments in his home country, but he still found a way to win eight tournaments aside from his three grand slams, which is four times more than what Williams did. The biggest gap between Djokovic and Williams comes when looking at their strength of schedule. Djokovic didn't have the luxury of avoiding the best players in his sport like Williams did, but that didn't stop him. Djokovic played 36 matches against other players in the top 10, which is six times more than Williams and he won 31 of those matches. Djokovic also managed to reach the finals of 15 events in a row in 2015. Williams reached five finals in total in 2015. The Serb outright demolishes Williams in every statistical category in 2015 and the nice thing is that neither of them is a horse, so it is very easy to make the comparison. I guess Djokovic needed to give out more chocolates to the press to get any love.